Looking for a vacation away from the hustle bustle of your job, your car and your city? Come to Montana and go camping in Glacier National Park! The majestic, glacier-carved peaks will awe you, the brilliant blue lakes will surprise you and the calm and serenity will relax you like no other place on Earth. Live full time in this national park by taking a relaxing camping vacation. There’s nothing like the quiet beauty of stargazing with a S’mores in your hand! Read here for a few fantastic campgrounds around the park. Nearby Whitefish has cozy hotels and mountain lodges to stay in when you’re ready to segway back into society. This campground is located in one of the most popular parts of Glacier National Park. Situated in an old growth forest of cedar and hemlock trees, the campground is shaded and cool in the summer. Tent camping and RV camping is allowed, but only 50 of the sites can fit vehicles up to 26 feet long. Sites are first come, first served with a seven-day maximum stay. Drinking water and restrooms are available. A couple of nice day hikes leave from the campground and the Avalanche Amphitheater is a great place for evening entertainment, with programs throughout the season. Located about 32 miles from the west entrance, you’ll find this campsite close to the Bowman Lake shore. It is in the North Fork area of Glacier National Park and has tree-shaded campsites. It is a quiet, calm place that is great for fishing. But don’t forget your bug spray- all those trout have to be eating something! Pit toilets are nearby and drinking water is available at the campsite. Daytime activities include picnicking, hiking, canoeing and kayaking. Motorboats allowed if they are 10 horsepower or less and are carried in (no boat ramp). 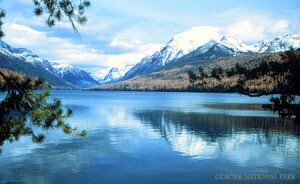 Read here for more information about boating in Glacier National Park. Campsites are first come, first served with a seven-day maximum stay. This is a camper’s favorite with access to the best hikes in Glacier National Park and fantastic wildlife viewing opportunities. Nestled in the trees, you’ll find shaded tent and RV campsites with drinking water and restroom facilities with running water. Nightly programs provide entertainment after sundown. Check with a ranger for the program schedule. Campsites are first come, first served with a seven-day maxiumum stay. Since Many Glacier Campground is so popular, it is advised that you come early! Note: All campgrounds are regulated by The National Park Service; check with a ranger before pounding any stakes.